PLEASE NOTE: This competition is now closed. Date 12/07/18. Big Wipes are the easiest, quickest, safest and most effective way to clean spillages, dirt and stains from both work surfaces and skin. Reusable, environmentally sound and are go-to wipes when you need grime busting power on the go. That’s why we’ve selected Big Wipes as our Product of the Month. Plus, we’ve teamed up to give you the chance to WIN a Big Wipes Swag Box! Find out more and enter at the bottom of the page. 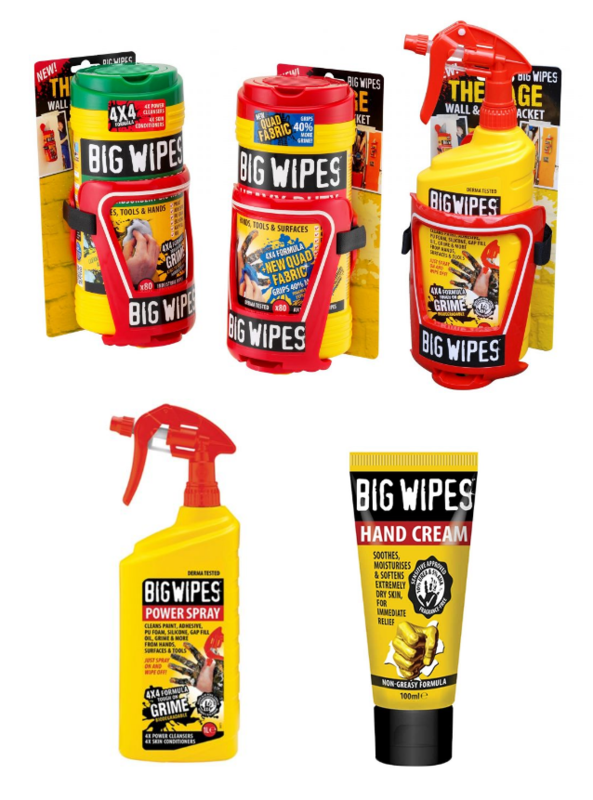 Big Wipes are ideal for wiping down your tools, hard work surfaces and even your skin. While they deliver exceptional cleaning results they are also kind to skin including a range of skin conditioners and have been designed to meet tough EU Regulation 1223/2009 for Cosmetic Products. Deliver exceptional cleaning results to leave every job looking clean and professional. These wipes are not only super absorbent and tough on a range of substances but also kind to the environment. The wipe is made of plant-based viscose and the 4×4 formula is biodegradable so as long as you’re removing a non-hazardous substance you can throw the wipe straight on the compost heap. The Multi-purpose wipes are three layered, non-woven and quilted to take on even the toughest industrial cleaning jobs. 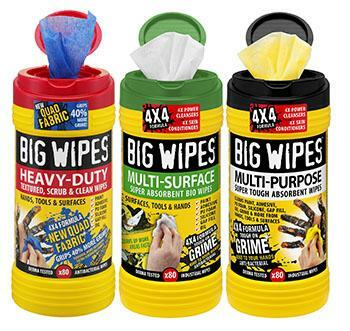 Big Wipes call this their Power Fabric Technology as it is tear resistant and leaves no lint behind. They include the same powerful 4×4 cleaning formula and skin conditioners to deliver exceptional results every time. Ideal for hand cleaning these wipes include high adhesion web technology which Big Wipes call their Quad Fabric. One side is abrasive to remove the most stubborn dirt and the other side is smooth to soak up the rest. The wipes are made of tear resistant, firm grip fabric to make cleaning easier and quicker than ever. The Power Spray from Big Wipes is suitable for all tools, hard surfaces and even your skin using the same unique 4×4 cleaning and skin conditioning formula. The spray can be used to clean larger surfaces, pre-treat stubborn stains on walls, floors or window frames before wiping clean. You can also use the spray to ‘re-charge’ wipes. This cream is designed to soothe dry, cracked and rough skin and, with its antifungal and antimicrobial properties, can even speed up the healing process. This convenient mountable bracket will keep your Big Wipes tub secure in your van, workshop or garage for easy use and one handed dispensing when you need it. 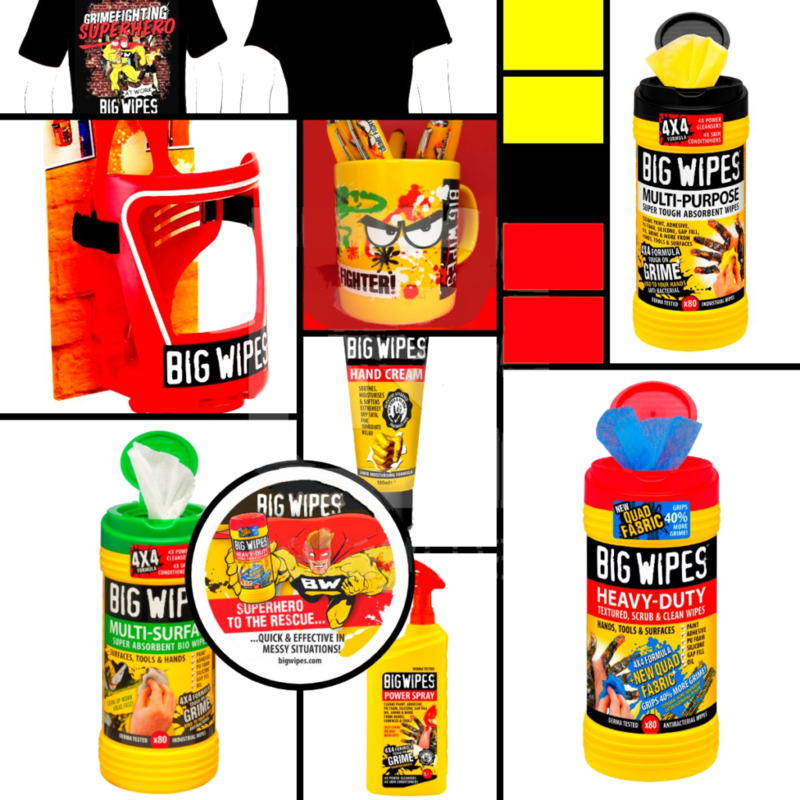 Big Wipes Swag Box Giveaway- Get All of These Great Products! Enter your details below and we’ll announce the winner on the 12th of July 2018. The promotion will run from 9am BST on 27th June 2018 (the “Opening Date”) to 23:59 BST on 11th July 2018 (the “Closing Date”) inclusive (the “Promotional Period”). The promotion lasts until 23:59 BST on the Closing Date. Any entries received after the Closing Date will be automatically disqualified from the promotion. The prize will be shipped within 2 weeks of the winner being notified and supplying details to Big Wipes. There is no cash alternative. Big Wipes reserves the right to substitute the Prize with a Prize of equal or greater value. The Prize is not negotiable or transferable. Details submitted by entrants will only be used for the purpose of this promotion. The details of the winner will be sent to Big Wipes to arrange delivery of the product. Details will not be kept or used for marketing purposes. By entering, the winner agrees to be mentioned in the Boiler Guide newsletter and Twitter account.